Volunteers needed, Translators, Narators, Duplicaters and Distributers. These testimonies need to get out to the whole world, and we need your help. If you would like to volunteer to translate one of these testimonies into your native language, here is how you can help. Click here for Guidelines for transitions. If you would like to be a volunteer CD Distributor and receive free CDs to distribute, Click Here! But if you would like to go further and be a Duplicator (burning CDs, making packets and sending them to people) Click Here! The people and testimonies shown on this website are also featured on Amazon.com, Google Videos, Yahoo YouTube.com, etc. Unfortunately many of the Lord's anointed messages have been slandered and accused falsely on the Internet. To see this, go to Amazon.com and look up your favorite Christian books, see what ratings and comments are being shown there. If there are any testimonies that have had a powerful impact on your life, leave your comments and ratings at Amazon.com, Google Videos, YouTube and other outlets where they are featured and comments are allowed. Don't let the enemy get away with slandering the Lord's anointed. Poor ratings have been left for Godly messages, and good ratings have been left for perverse messages. For example, if you look up JESUS CHRIST on Youtube.com, all sorts of nonsense shows up on top of the list (See Picture). Goto these Media outlets, and leave your ratings, so that Godly media shows up 1st on the list, and filter out the garbage. Here is an example of how Mary K. Baxter is slandered on Amazon's Book Review, please go and leave your opinions. Take the videos off of this site and upload them to the several Internet Video sites (i.e. YouTube.com, Jesusclips.com, livedigital.com, broadcaster.com), check to see if these testimonies are there. If not, then upload them yourself. This is a great ministry, we uploaded the Jesus film to a Chinese Video site (56.com) , and in no time it reached 50,000 people!!! But remember, just reaching 1 person a day is still worth doing it. Upload Christian Videos to Video Sites. VIDEO SITES have different requirements for what videos they allow. For example, Youtube allows only 10 Minutes Clips, (up to 2GB). Yet other sites, allow longer videos, yet limit you to only 100MB. So to put a Christian video in the right format, you'll need to use a Video Conversion Program. It can both Chop up videos into 10 minutes segments, or it can compress a video down to 100 MB. But it only makes WMV files. Click here for Full Instructions. Currently there are tens of 1000s of unGodly websites, spreading all kinds garbage, along with false and destructive lies about God. Pray that the Lord would discredit any message that claims to be from Him but is not. Pray the Lord's judgment (not wrath) against all unGodly websites; pornographic, slanderous, evil, false perverse and malicious websites. May websites that offend the Lord be removed, in Jesus Name! 60% of the world are audio learners, so just having textual testimonies will NOT reach them. Many of these great testimonies need to be made into Audio MP3 format. They they will be much more fruitful. If you would like to volunteer to Narrate one of these testimonies, it will take a little computer experience but here is how to do it. You will need an Audio Record & Editor. 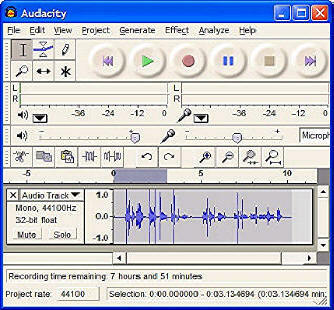 I recommend AUDACITY. Once you have it installed, play with it for a while and get experienced with all the features. You will need a microphone and speakers on your computer. The first thing you'll need to do is to record 2 minutes of absolute static (background noise). Don't let any other noise be recorded, just static (complete silence). And save it in WAV format (not MP3) (no compression). If you listen to it at high volume, it should sound like 'hissssssssssss'. Why do this? 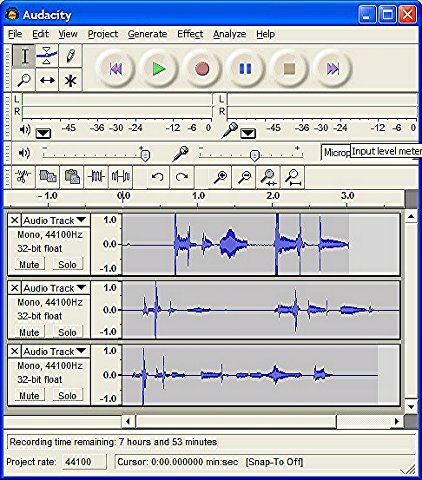 Because the computer will need to have a sample of your microphone's static (background noise) in order to remove it from your recordings. You will do this later on in the process, and it will make a cheap computer microphone recording sound more like a professional recording studio. For narrating text, I will usually read a section carefully before I try to record it. Then, when I do read it, it will go much smoother. Remember, you want to make it sound like you are the author, with all the stress, pauses, tones and emotion that the author would have. And if you are quoting different people, like an Angel or the Lord, then use a different tone for them, so the listener will know that a different person is talking. Try to speak as clearly as possible, with nothing making noise in the background. You can add (dub) a musical background into the recording, later in the process, but not while recording. While you are recording, record at a high volume. Audacity has a meter that will show you if you are going to loud (clipping). Put the microphone about 3 inches in front of your mouth. This is so that you will have the best Signal to Noise Ratio, (greatest voice volume, lowest static volume). Do not talk straight into the Microphone, if you do you'll get pops, or puffs of air that hit the microphone and sound very loud. When you blow wind out of your mouth, for example saying the word, "POP", the wind should not hit the microphone. A. Click PROJECT / IMPORT AUDIO, and select the STATIC (WAV) file that you made before. B. Then Select (highlight) just that static and click EFFECTS / NOISE REMOVAL / GET NOISE PROFILE. D. and choose EFFECTS / NOISE REMOVAL / (move the slider bar to the least amount, higher amounts distort your voice) / REMOVE NOISE. Once you've removed the static, check over your recording to see if it is acceptable. (EDIT / UNDO NOISE REMOVAL) if you made it worse. When your done with the entire work, then you can Paste all the individual files together into one MP3 file, and save it as your master file. When you are all finished, listen to your entire work, and cut out any mistakes that you have made. Remember every time you open an MP3 file, and save it, you loose one generation and it slowly becomes distorted. That is why I start a new file for every day's work. Send us the finished work (DivineRevelations) and I'll put it on the website. You should also send it to other Christian Websites of your language, to distribute it all over. Pray for the Lord guidance through this process. Set up your own POD Cast of Christian stories and testimonies, it will reach many different groups of people. Apple's IPod directory can drive large numbers of hits to these testimonies, if you know how to set it up. There are many places on the Internet with false biblical teaching, anti-Christian messages, and foolish spiritual beliefs. And these sites are confusing people and influencing many people away from the Lord. Christian Commentators are desperately needed. Dedicated men and women of God who will go to these places of influence on the internet and clearly present the Word of God. Can you help? If you would like to join a team of devoted Christians willing to go into dark places and preach the Word, please Click Here! If you see any advertising on this site that is CONTRARY to the message of this site, please e-mail me (DivineRevelations) and tell me which website you were led to. I've found a lot of ads that bring people to false sites or sites that say Hell doesn't exist. I have a way of filtering them out. But don't click on that ad unless you desire to know about that site, otherwise it is a violation of my Google contract. Please give me the site name that is mentioned on the ad. Thanks.